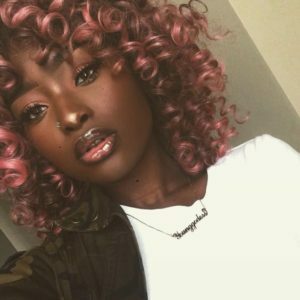 Dark skin tones are not one size fits all, and it can be hard to figure out which hair colors will look best with your specific dark skin tone. 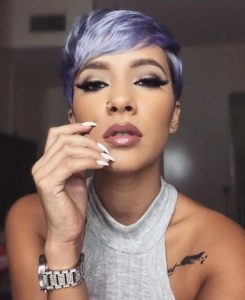 Contrary to popular belief, women with darker complexions can definitely rock lighter hair colors in blonde and red shades, and there are also a ton of unnatural colors that you can experiment with. If you’re looking for the perfect new hair color to compliment your face, read on to see 30 of our favorite trendy styles in the best hair colors for darker skin tones. An incredible example of why you don’t need to have ultra pale skin to wear an ultra light shade of blonde, Zoe Kravitz absolutely slays in this platinum pixie. Because her tan skin has cool olive undertones, an ashy light blonde really suits her face and helps to bring emphasis to her (already stunning) features. 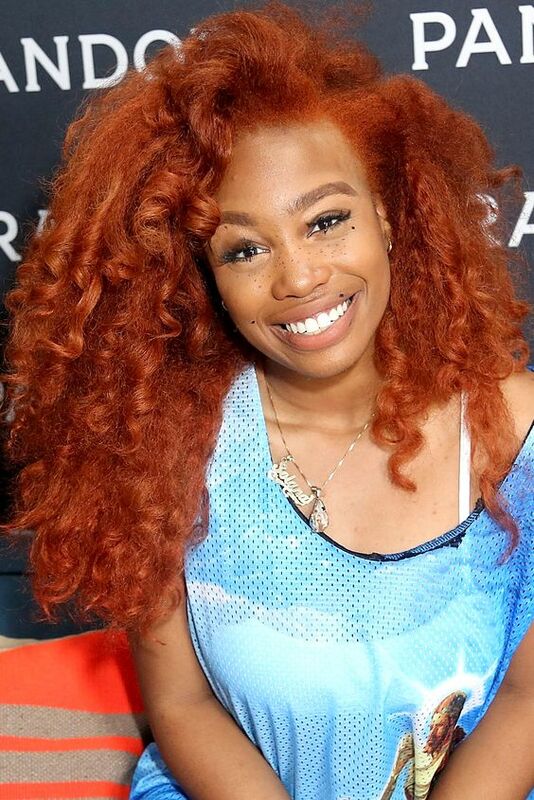 Bring out the warm undertones in your tan skin with a dimensional auburn and copper hairstyle. While this dark shade of reddish brown can also suit cooler skin, ribbons of copper bring out a golden glow in your cheeks and make minimal makeup look shimmery and luxurious. Treat your light tan skin to one of the trendiest hair colors around with a rose gold dye job. 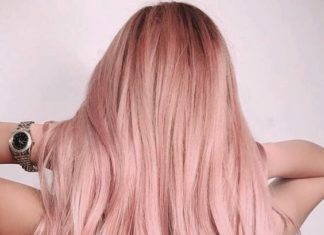 Mixing peach, pink, and champagne blonde, this style is dimensional enough to make all these light pastel colors look glamorous and sophisticated. 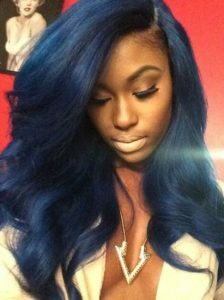 This is a super trendy color, and one of our favorite hair colors for dark skin. 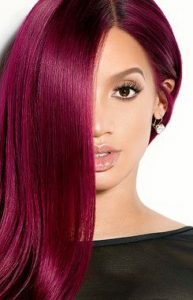 If you’re looking for something more rich than a pastel style but more outgoing than auburn or blonde, this deep fuchsia hair color will leave you more than satisfied. This bold shade works well with both warm and cool undertones, and we especially love it against green or hazel eyes. True red can be a tough color to pull off, but if you’ve got light tan skin like Rihanna you’re one of the lucky ones who can wear this vibrant shade. 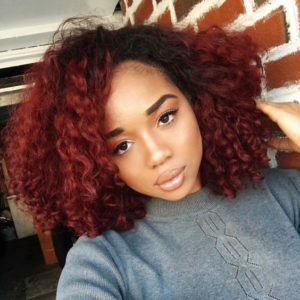 Red hair color is the fastest to fade, so you should go into this style prepared to properly maintain the look and head in for frequent touch-ups. 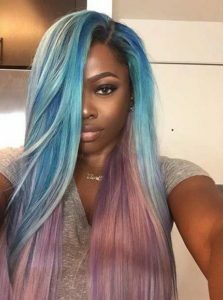 Buying color-specific shampoo and washing less frequently are good ways to stretch this vibrant style as long as possible. Dark tan skin with warm undertones looks great in equally warm shades of red and copper. 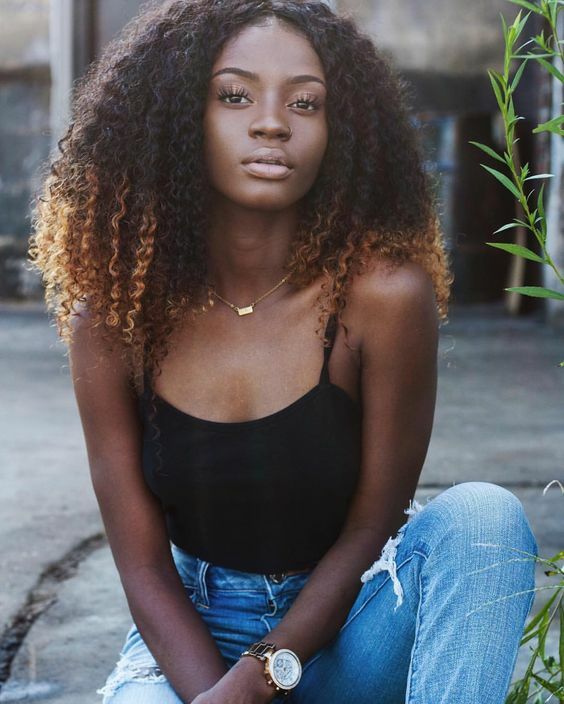 If you’ve got long natural curls, layered color that’s lighter on the outside and darker on the inside can help bring dimensional color to your look without being dependent on your specific curl pattern. For dark tan skin with cool green undertones, an icy shade of lavender is the perfect way to wear your hair in a bold and unnatural shade. If lavender isn’t for you, silvery shades of blue and green can produce a similar effect. 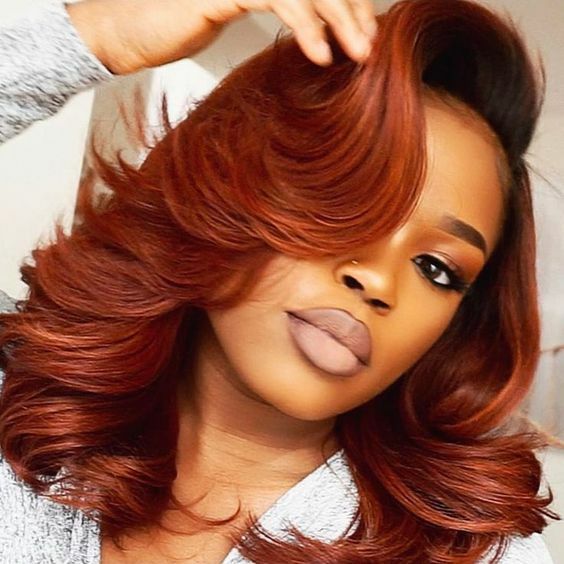 One of the trendiest colors for this fall and winter, wearing warm hazelnut hair with dark tan skin creates a sophisticated effect where hair and skin colors are quite close together. This gives you tons of room to play with accent colors in your clothes and makeup, or you can keep it neutral for a look that’s chic and understated. If you’re after a red hair color that will look high-contrast against your dark tan skin, a deep shade of auburn is the perfect choice for fall. 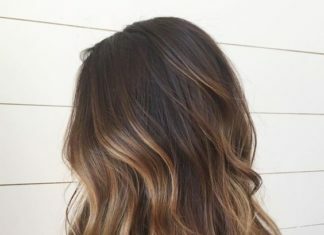 Dark exposed roots help to make this style look natural and make for an easier time keeping up with color maintenance. Warm blondes and browns mix together in this gorgeous caramel hairstyle. 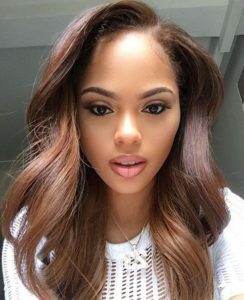 For an extra glow in your dark tan skin, copy Ciara’s technique and opt for face framing highlights that will make your features pop. If you want an ultra subtle upgrade from your natural black hair, try a dark chestnut brown style. Ashy tones in this color will look best against cool toned skin like Zoe Saldana’s, while women with warmer complexions should opt for a brown with more reds in it. 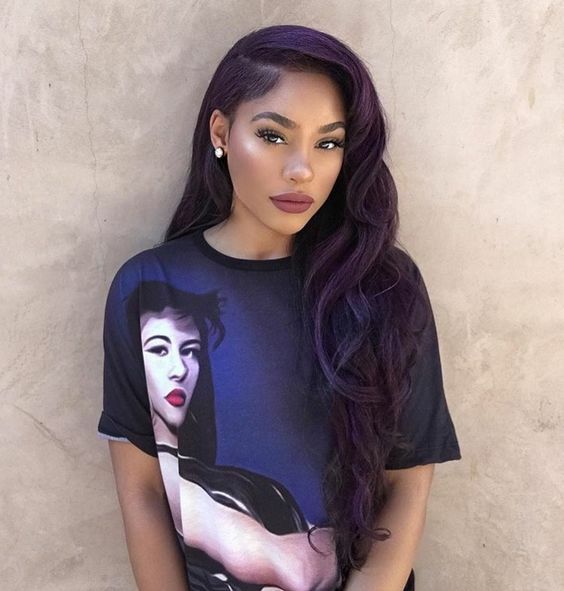 Dark purple and light brown create an extra luxurious color palette, making this deep plum shade a perfect choice for women with light or medium brown skin tones. 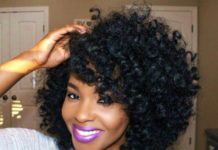 If you’re worried about diving in to a boldly unnatural hair color, choosing a shade this dark won’t look completely different from your natural dark brown or black hair. 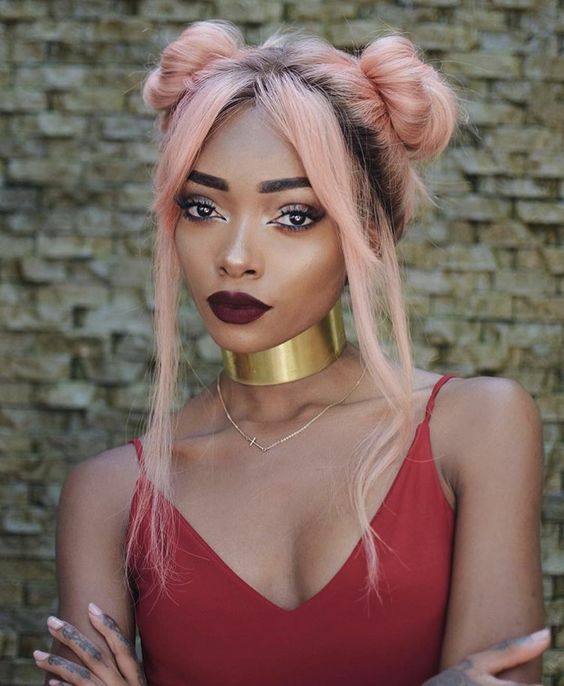 Light brown skin with warm undertones matches surprisingly well with a warm pastel color like this peachy pink. Try it out for spring or summer! Subtle highlights that are just a shade or two lighter than your natural base color can make a big impact to your face without requiring a ton of work or upkeep. 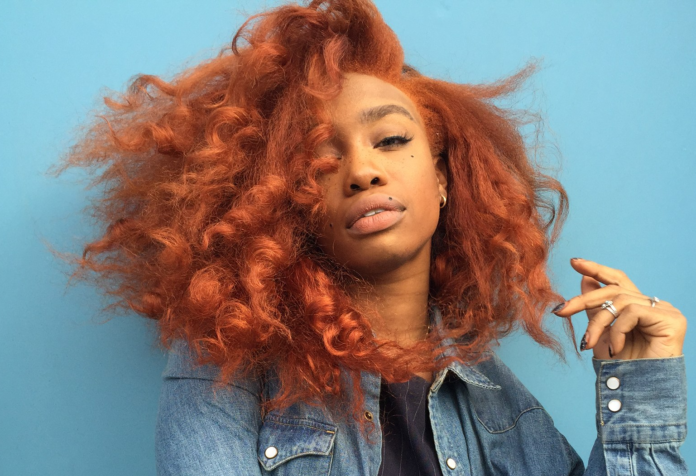 Vibrant copper gives you one of the trendiest hair colors and a style that will make your light brown skin tone look deeper and more radiant. If a full head of blonde feels too unnatural for your medium brown skin, brighten up your dark brown or black hair with blonde highlights all over. 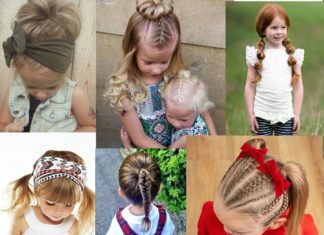 Ashy blonde is best for women with cool or greenish undertones, while medium brown skin that’s warm and golden looks stunning with equally golden blondes. This warm shade of golden copper strikes the perfect balance between red and brown hair colors, and makes a great choice for women who have rich red undertones in their medium brown skin. If you’re trying out your first unnatural hair color or don’t want to chemically lighten your natural strands, box braids offer up a fun way to try new colors in a protected style. Dark teal is a trendy shade that you easily adjust for your specific skin tone. 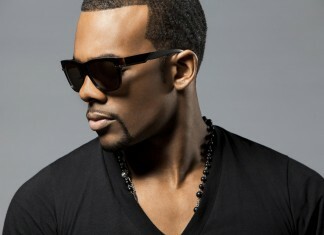 Go more on the blue side if you’ve got cool undertones, or choose green if your medium brown skin is golden and warm. If your ideal unnatural hair color is dreamy and attention grabbing, cotton candy pink is a stunning match against medium brown skin tones. This shade can emphasize pink tones in your cheeks and lips, and gleefully breaks the rule that pastel shades are only for women with pale skin. 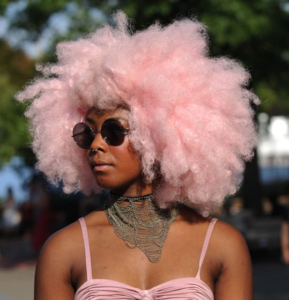 If you like bold color on your darker skin, this baby pinkish shade is super trendy and stylish. 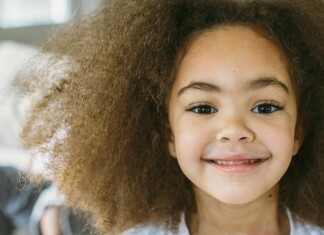 A single tone of blonde might feel unnatural against medium brown skin tones, while a rich dimensional color that mixes golden blondes and browns helps to balance the lighter color against darker brown skin. 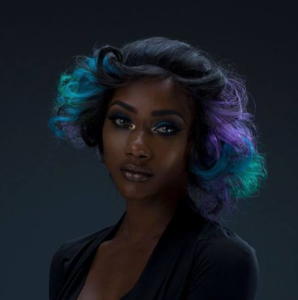 Dark brown skin looks great against equally deep jewel tones like this purplish black. 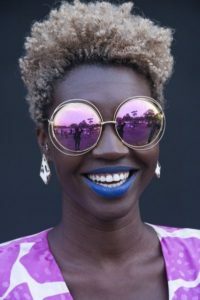 We love warm purples against golden undertones, but you can opt for a blue black if your dark brown skin is a cooler shade. 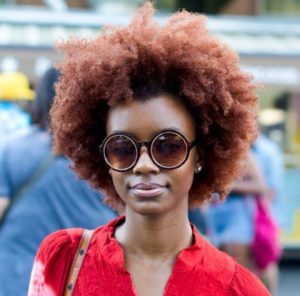 Want hair that feels natural without actually being your natural color? 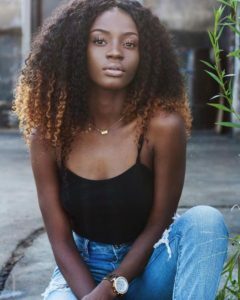 This shade of rust is a subtle and simple choice for most darker skin tones, but looks especially flattering on dark brown complexions. If you’re looking for a new hair color that’s dramatic and moody enough to wear in the winter, this dynamic midnight blue will provide the perfect frame for your features. Lavender is often thought of as an ultra light pastel shade, but there are lots of ways to wear the color in a more saturated style. Crazy rainbow hair can be fun, but we love the curated look of these cool blue and purple shades together. Wear them with your dark brown skin if you’re prepared to get compliments everywhere you go. 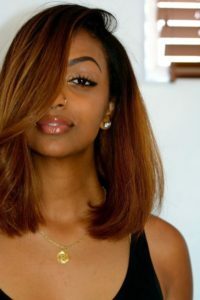 If you’re worried about making blonde hair work against your dark brown skin tone, try an ombre style or peekaboo highlights. Shades that aren’t right up against your face won’t have the same impact against your complexion, and give you much more room to experiment. Lupita Nyong’o’s bronze skin has red undertones that look great against a very dark shade of burgundy. If you’re looking for an unnatural shade to make your dark bronze skin sparkle, chocolate rose gold is a chic and trendy choice. With a much darker brown base than other rose gold styles, this pink hair looks rich, warm, and well suited to your darker skin. 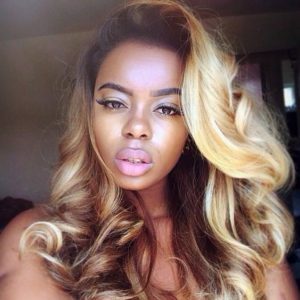 Does dark skin blonde hair combination works? We think so! We love the bold combination of dark bronze skin and a bright blonde hair color. 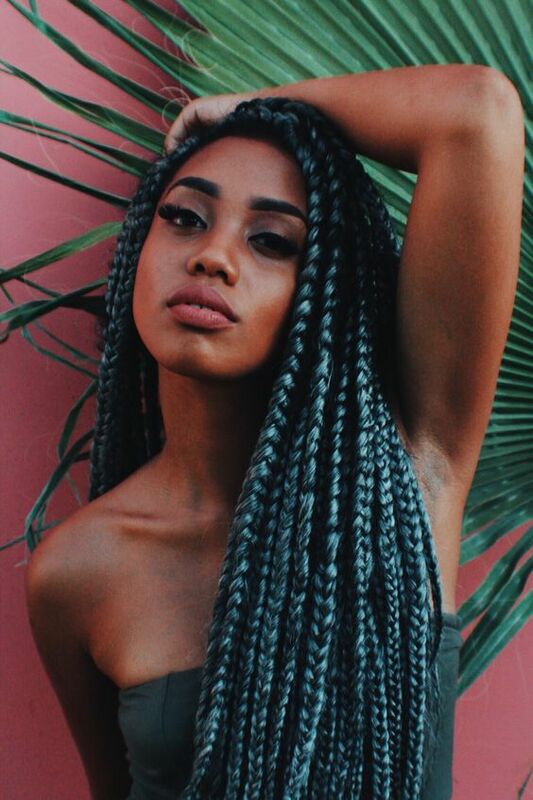 Lean towards an ashy blonde like this if you’ve got cool blue-black undertones in your skin. 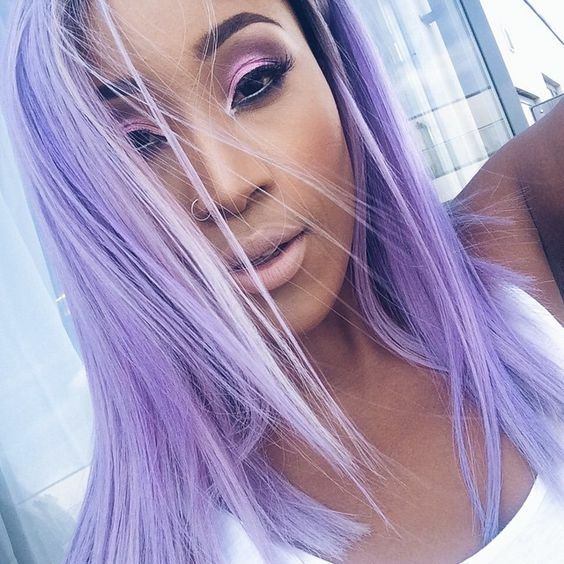 Love pastel but don’t want a whole head of it? Use strategic highlights to try out the latest color trends without committing to wearing light purple or green right up against your bronze skin. This is a good strategy for your first try of a bold hair color or anyone who’s unsure about their complexion and undertones. Beauty blogger, photographer and hair and makeup Junkie!